10/3/09 – Heritage – Paris, Ministère de la Culture and Conseil d’Etat – The fire which broke out on 2 March at the Palais-Royal in Paris fortunately produced no casualties and did little damage to the premises. Two adjoining rooms were affected but these did not contain any old décors, only reconstitutions (relatively well executed) under Jack Lang’s second term as minister in 1989. 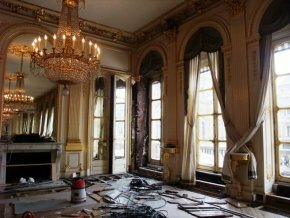 One of them is the room known as the Maréchaux (ill.) which is used as a reception hall by the Ministry of Culture. The other, the Salle de la Section des Finances, belongs to the Conseil d’Etat. The fires at the Parlément in Rennes and the château in Lunéville have made the personnel at the ministry particularly sensitive to the problems related to fire hazards. They responded very quickly, notably by rolling away the old rug which decorated the room to protect it from the flames. Only the paneling which is part of the recess on one of the windows actually burned. It seems curious to learn that work is currently been carried out at the Ministry of Culture to update the electrical installations. This incident reflects the vital need for its completion. The work should have been done a long time ago but it would appear that the present minister was the first to willingly accept the inconvenience of moving implied by the refurbishing. Still on the subject of the Ministry of Culture, we would like to point out some excellent news : the restoration of the Victor Louis colonnade, currently supported with reinforcements (see news item of 13/2/09), is indeed planned to begin next year. Communication between the ministry and the Caisse des monuments nationaux (which depends on the former) had, it seems, been at fault which is why we had not received a clear answer to our question.